The crew of the Afternoon Delight have eaten many cups of instant noodles. They’re tasty, perfect for spending days in hyperspace, and you can have original or spicy. They first appear in Episode 14 when Xianna makes a few cups for everyone. While the following “recipe” isn’t as shelf stable as cup noodles and it isn’t quite as instant, but they’re much better tasting and still pretty fast. “Recipe” is in quotations because what follows is less of a specific recipe and more of a set of guidelines. 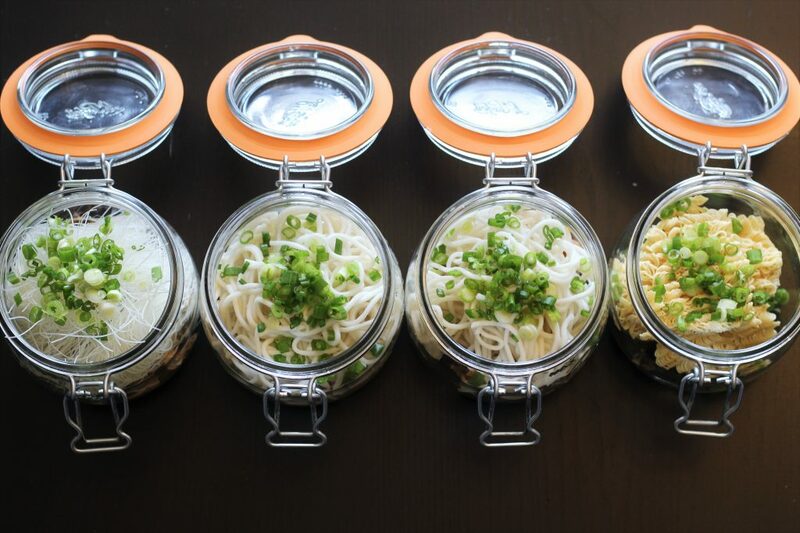 There’s a lot of ways to customize your specific noodles. 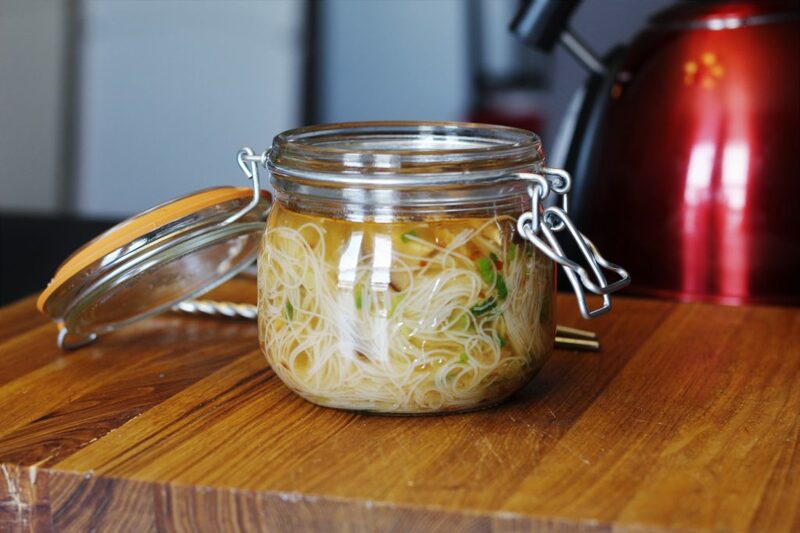 A finished jar of *Almost* Instant Noodles. 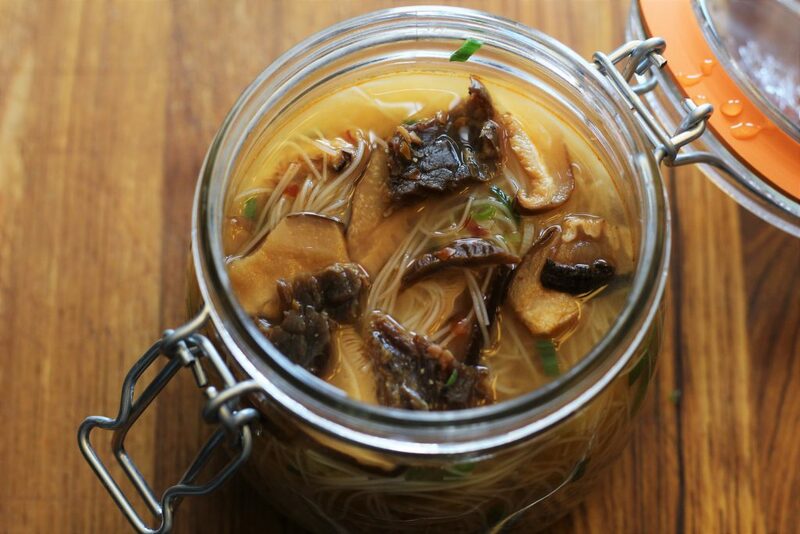 These noodle cups can easily be stored in the fridge for a few days and handle being at room temperature for a few hours, which make them great for office lunches. You can even make them with all dry ingredients for shelf stable cups that should last at least a few weeks. You’ll want a 16-ounce container that is heat-proof since you will be adding boiling water. Large mason jars or wide-mouth preserving jars work great. Let’s start at the bottom with the soup base. You can use bouillon paste, a bouillon powder, or even powdered soup mix. If you want to use bouillon cubes you’ll want to smash them up a bit before adding. They dissolve better that way. You’ll want to use 1-2 servings of whatever soup base you use, depending on how strong you like your soup. We’re using Better Than Bouillon paste in their Vegetable flavor and adding 3 teaspoons, about 1.5 servings worth. Then you’ll want a “flavor boost”. Something to give your cup a little extra flavor and depth. This could be soy sauce, chili paste, miso, fish sauce, curry paste. Anything that will add something a little extra to the soup. You can even combine them. How much you add will depend on which you choose and personal taste. If you’re going completely shelf stable then omit the “flavor boost” and just add a bit more powered base. Soups bases and “Flavor Boosts”. 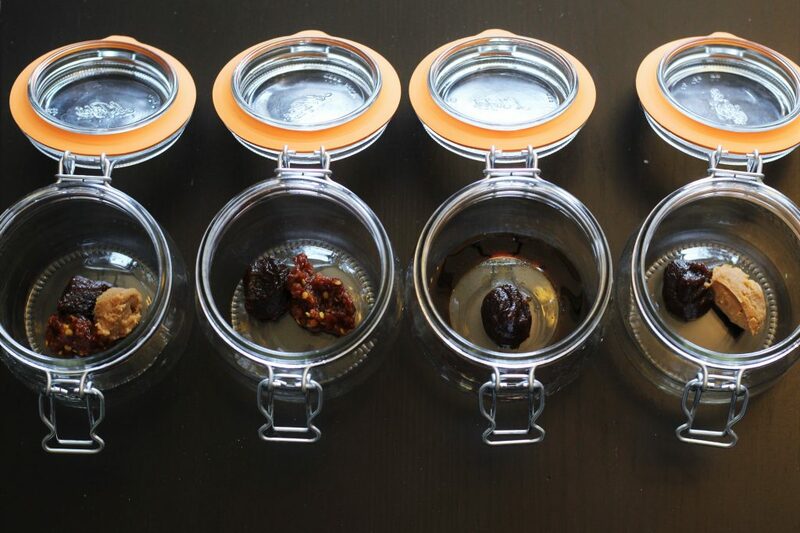 Left to Right: Bouillon paste, miso, chili paste; Bouillon paste, chili paste; Bouillon paste, soy sauce; Bouillon paste, miso,. dried shiitakes, freeze-dried vegetables are great, fresh or frozen edamame works, basically anything you can think of. You do want whatever you add to require minimal cooking, since they will only get a short soak in hot water. So raw onions may be a bad idea. Now we’re at the strangest option: beef jerky. Since we want these sit in a fridge for a few days, at a desk for a few hours, or even on the shelf for a few weeks, raw meat is a bad idea. It also probably won’t be cooked by just a few minutes in hot water. But if you’re looking to add something meaty to your cups jerky is the way to go. It lasts for a long time, and when it reconstitutes in the water it softens up and gains a pleasantly chewy texture. You can even play around with what flavor you use. We used a “Hot & Spicy” jerky. The veggies and jerky. 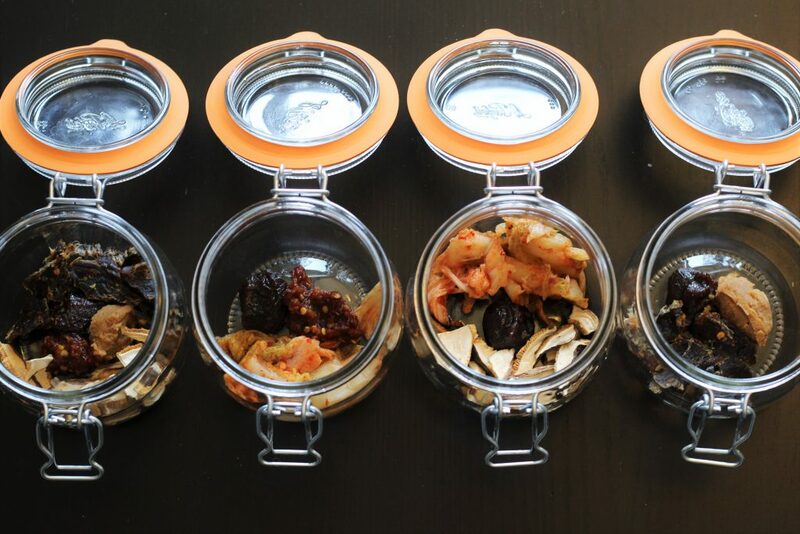 Left to Right: Jerky, dried shiitakes; kimchi; kimchi, dried shiitakes; jerky. And now, we have come to the noodles. You can use precooked wheat noodles, such as udon, Lo Mein, or even spaghetti noodles. You can also use “fast-cooking” dried noodles, which are basically the noodles that come in ramen packages and commercial noodles cups without all the extras. Rice noodles are also a great option since most only take a few minutes to cook. 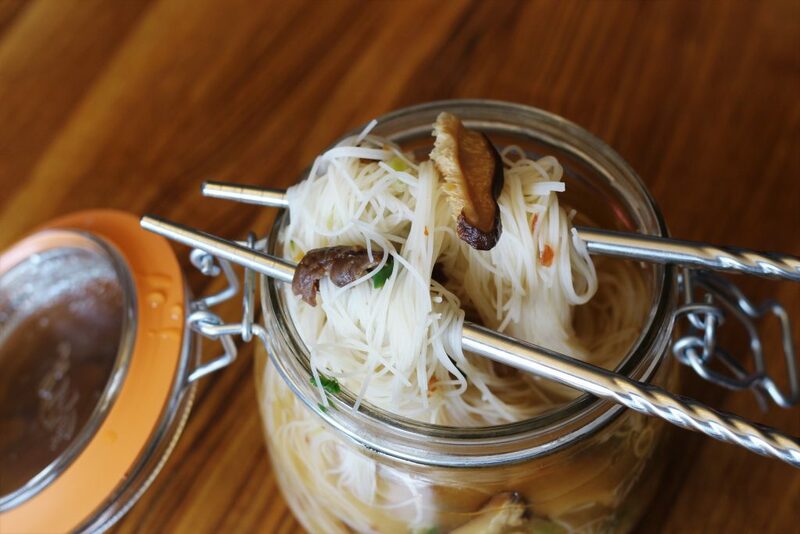 There’s rice vermicelli, flat “pad thai” noodles, pho style noodles, and many more. 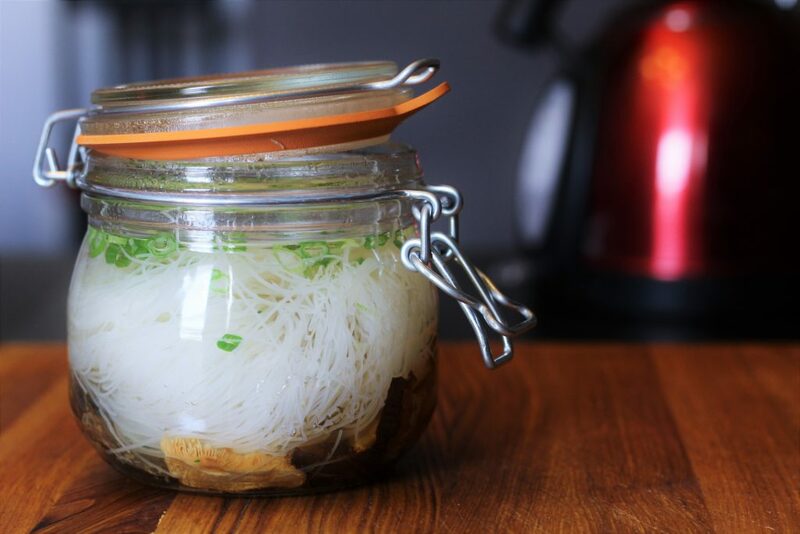 The vermicelli styles can be rolled or folded into little nests that can fit into the jars. Long, straight noodles may have to be cut in half to fit into the container. Finally we have green onions or chives. These add a little fresh pop that ties everything together. You can use fresh or the freeze-dried kind that you can often find in the produce section. The noodles and green onions. Left to Right: dried vermicelli; cooked udon noodles; cooked udon noodles; fast-cooking ramen noodles. Then, whenever you want your noodles, simple add boiling water, close the lid, and let sit for 3-5 minutes. Then, give it a good stir and you’re all set! After 3-5 minutes. It’s noodle time! Look at that soupy goodness. In the bottom of a 16-ounce heat-proof container add 2 servings of the base, the flavor boost, vegetables, and jerky, if using. Place noodles on top and then the green onions or chives. When ready to eat, fill the container almost to the top with boiling water. Loosely set lid on top and let sit for 3-5 minutes. Stir to combine.